greetings and hello friends, family, and readers. much has been taking place within the art + clothing project over the summer. it’s been a very fruitful adventure releasing the new summer collection-as well as hosting art shows and pop-ups throughout the city of New Orleans. if you are reading this and attended one, wow seriously thanks- we really appreciated your involvement 100%. 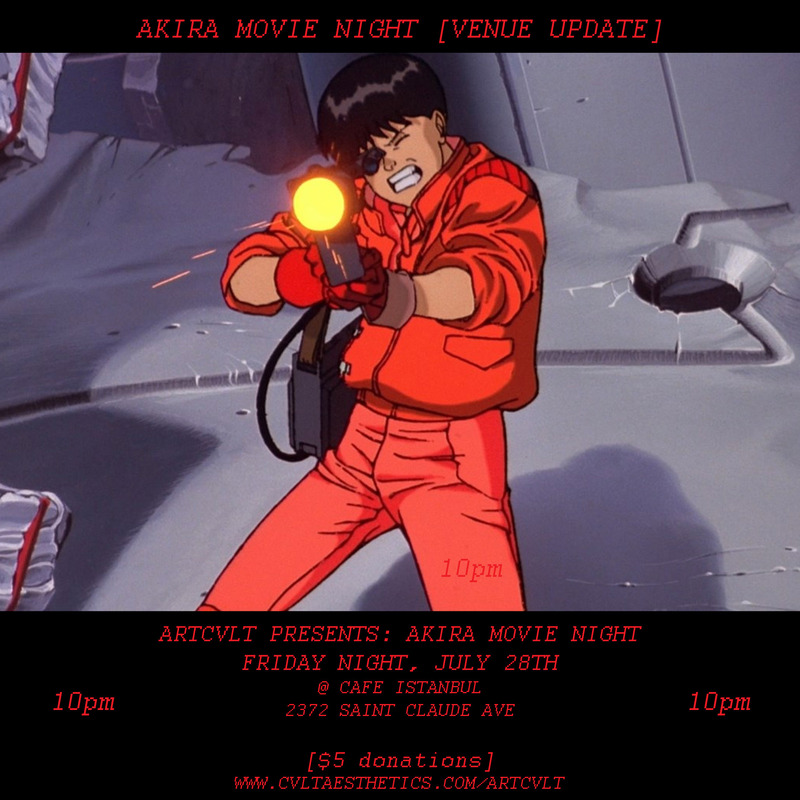 our next production will be an AKIRA movie night. Akira has been a movie that’s inspired the core art and aesthetic of our project. it’s more than just a movie night for us. it’s a chance to celebrate the things that inspired us creatively growing up. we want our family of artists and lovers of the craft to gather in a very intimate setting for this legendary film. sharing drinks, snacks and forgetting the outside realm for just a moment. we invite you to become inspired as we were when viewing this movie. the art, animation, and music will consume you entirely bringing you directly to Neo-Tokyo. as we grow older we find it vital to be reminded of the very things that shaped our creativity. we find so much value in this. thank you all for helping make this a success before it even takes place. we are coming out of pocket to provide sound and kind of pull the production together- when you come Friday please take a moment to look at our artwork set up and snag a print or a new tee shirt. also not only just us- there will be a few other sponsored brands/visual artists helping make this event a success, so if you are able- pick up art/merchandise from them as well. did you hear about our art pop up in the middle of the French Quarter?